Although the Sydney-based Tamam Shud (the unusual name is probably a corruption of Taman Shud, borrowed from The Rubaiyat of Omar Khayyam) was formed in 1967 by singer/guitarist Lindsay Bjerre, the band only sprang to prominence when their superb debut album, Evolution, was issued by CBS (SBP 233761) in 1969. Having established themselves with Evolution, the band went on to record their opus major for Warner Bros in 1970 in the form of the ambitious Goolutionites And The Real People (WS 20001), a stunning and imaginative work dominated by the prodigious talents of 16-year old guitarist, Tim Gaze. Gaze's precocious guitar work was conspicuously present throughout the album, although it was on 'A Plague' and 'Stand In The Sunlight,' both of which were to appear as 45s, that his playing really shone. Although Gaze left the band immediately after the album's release to join Kahvas Jute, he returned later the same year, and remained in the group until it disbanded in 1972. Goolutionites is widely recognised as one of the finest Australian prog-psych offerings of all time. 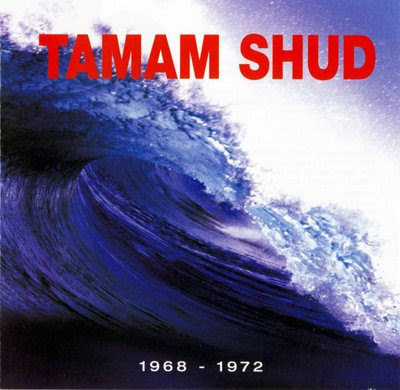 Tamam Shud belong to a rich vein of Australian music which has been spawned and supported by the alternative surf culture along Sydney's coastal north, and also gave rise to Midnight Oil; more recently Grinspoon. The group Tamam Shud grew out of the instrumental surf music scene of the mid- Sixties and became one of Australia's first 'progressive' rock bands. The early Sixties instrumental sounds inspired by the Ventures and then the Shadows found another, perfect form of expression when it applied itself to the new surf music craze. Sydney's Atlantics led the field in Australia. In 1964 Newcastle instrumental group The Four Strangers distinguished itself in the field with a single, 'The Rip'. Once the Beatles and the Rolling Stones arrived those instrumental groups invariably became the new groups of the era, already equipped to play their music themselves. All they needed was a singer. The Four Strangers found Lindsay Bjerre, and moved into the Rolling Stones/r&b style. Now just called the Strangers, in late 1965 they became the Sunsets, a pop group playing alongside the heroes of the day, Billy Thorpe and the Aztecs, and Ray Brown and the Whispers. In late 1967 the group's line-up and musical philosophy changed again. The new adventure in music was 'progressive' rock. This was the post Sgt.Pepper time of Cream, Traffic, Jimi Hendrix. In Australia it found its own expression in the renamed Sunsets, taking as much from their local surroundings as they did from their global influences. Initially Tamam Shud (meaning 'the very end') took to the free-form aspects of progressive rock, stretching loosely structured songs into long rhythmic and melodic workouts. Film maker Paul Witzig saw the band and its music as a perfect complement to the surf movie he was creating. He set the band up in front of a screen and Tamam Shud spent two and a half hours playing and recording as they watched the surf footage. The result was the band's first album, which carried the same name as the movie, 'Evolution'. Witzig paid for the session and took four songs for the soundtrack of his film. Tamam Shud were now at the spearhead of Australia's progressive rock movement, quickly followed by Tully and Spectrum. The second album was a more traditional and structured affair (comprising actual songs) but just as ambitious in a totally different way. Called 'Goolutionites And The Real People' the album was a concept suite, centred on the polluters of the world, the Goolutionites. The album featured the band's new 16-year old guitarist Lindsay Gaze, who left again just before 'Goolotionites' was released. Within four months he was back, having recorded an album as part of Kahvas Jute. I'll take this post cause I have no Evolution, but only Goolutionites. Thanks for share.